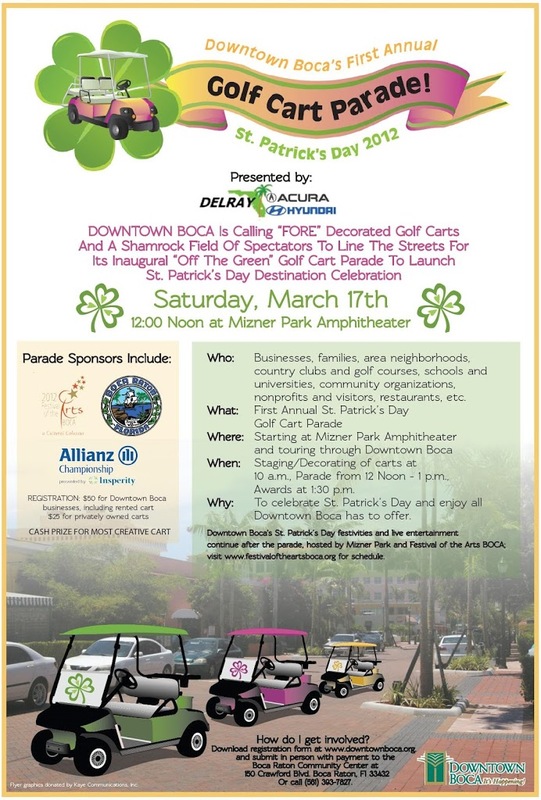 BOCA RATON, FL – Downtown Boca invites families, area neighborhoods, country clubs and golf courses, schools and universities, and visitors to “rev up” their St. Patrick’s Day celebration on Saturday, March 17th by registering to participate in or lining the streets for its First Annual “Off The Green” Downtown Boca Golf Cart Parade presented by Delray Hyundai-Delray Acura and held in conjunction with Festival of the Arts BOCA St. Patrick Day Extravaganza. Including several solar-powered carts featured by Shamrock GREEN Sponsor: the PGA Tour’s Allianz Championship, the free, family-friendly, open-to-the-public parade will begin at 12 Noon at Mizner Park Amphitheater (590 Plaza Real). To showcase Downtown Boca’s great shopping, dining, cultural, entertainment and lifestyle offerings, the golf cart parade route will take the decorated carts all throughout Downtown Boca– through Mizner Park, across the pedestrian promenade and Sanborn Square, down Palmetto Park Road and around Royal Palm Place, with all carts returning to Mizner Park Amphitheater for judging. Spectators can watch the festivities from Sanborn Square or from the official “watch spots” and favorite Irish pubs and eateries in Downtown Boca. 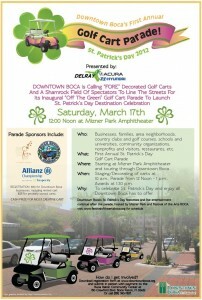 A $250 cash prize and “Irish Gift Basket” will be awarded at the conclusion of the parade at the Mizner Park Amphitheater clock tower to the most creatively decorated golf cart, as judged by representatives from local Irish establishments. Please click to enlarge poster/flyer.